Bitcoin Cash (BCH) was the result of a BTC hard fork in Aug 2017, and had the support of key industry players Bitmain, Roger Ver and Craig Wright. One year later, Bitcoin ABC (BCH ABC) proposed Bitcoin ABC 0.18.0 for the 15 Nov BCH network upgrade, again supported by Bitmain and Roger Ver. However, Craig Wright introduced his own Bitcoin Satoshi Vision (BCH SV) 0.1.0 proposal for the network upgrade, supported by billionaire Calvin Ayre. The BCH community has since split into the camps of BCH ABC and BCH SV. Conflicting ideologies and visions for the future of BCH has led to the community split. BCH ABC acknowledges the fundamental design of BCH, and proposes network updates including the introduction of canonical transaction ordering to enable future improvements to scalability. On the contrary, BCH SV proposes a fundamental re-design of BCH, and sets out to enlarge the block size from 32MB to 128MB, also with the claimed goal of promoting scalability. The BCH hard fork has led to a mining war between the two camps. While the mining war is still ongoing, BCH ABC takes the lead with 42.8% ahead on proof-of-work and 15 blocks ahead against BCH SV. BCH SV was the leader leading up to the fork, having controlled ~69.5% of the BCH network hash rate on 13 Nov. However, BCH ABC took the lead when Roger Ver’s Bitcoin.com announced the shifting of hash power from BTC to BCH, and the hash rate of BCH ABC at one point surged from 3253 to 8705 PH/S, as noted in our Chart of the Week. It is worth noting that both camps are mining BCH at an estimated loss of 327 BTC. This loss is likely to grow further in the near future, as Craig Wright has claimed to consider the mining war a “marathon race”, while BCH ABC claims they have no intention to launch a 51% attack on BCH SV. The mining war has raised serious concerns regarding the future centralization of BCH. The future development of BCH will be highly dependant on BCH ABC and BCH SV, who currently account for the vast majority of hash power in mining BCH. This raises centralization concerns as these entities can easily launch 51% attacks to overtake the blockchain. The crypto market has slumped following the BCH hard fork, with BTC hitting a new 2018 low of US$ 5358. 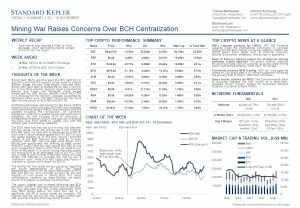 We may speculate that the hostile statements from both BCH camps before the hard fork led to a significant sell-off of crypto assets by investors. We foresee that the mining war may trigger further sell-offs, and that the BTC price may slump further.